Invented by Tim Berners-Lee at CERN in the years 1989–1991, HTTP (Hypertext Transfer Protocol) is the underlying communication protocol of World Wide Web. HTTP functions as a request–response protocol in the client–server computing model. HTTP standards are developed by the Internet Engineering Task Force (IETF) and the World Wide Web Consortium (W3C), culminating in the publication of a series of Requests for Comments (RFCs). HTTP has four versions — HTTP/0.9, HTTP/1.0, HTTP/1.1, and HTTP/2.0. Today the version in common use is HTTP/1.1 and the future will be HTTP/2.0. Both HTTP/0.9 and HTTP/1.0 required to open up a new connection for each request (and close it immediately after the response was sent). 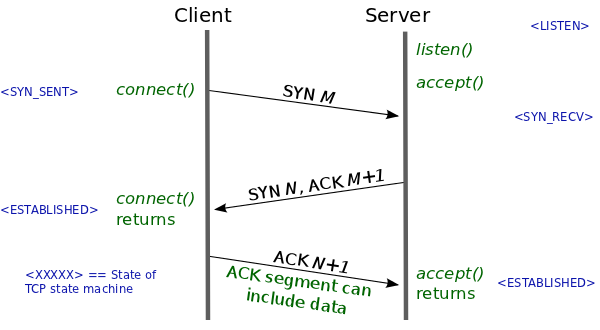 Each time a new connection establishes, a TCP three-way handshake should also occur. For better performance, it was crucial to reduce these round-trips between client and server. HTTP/1.1 solved this with persistent connections. This is the HTTP version currently in common use. Introduced critical performance optimizations and feature enhancements — persistent and pipelined connections, chunked transfers, compression/decompression, content negotiations, virtual hosting (a server with a single IP Address hosting multiple domains), faster response and great bandwidth savings by adding cache support. The Keep-Alive header was used prior to HTTP/1.1 and was obsoleted by HTTP/1.1 making persistent connections the default behavior. Keep-Alive header can be used to define policies for long-lived communication between hosts (i.e. allows a connection to stay active until an event occurs). This laid foundation for persistence, reusable connections, pipelining, and many more enhanced capabilities in modern web communication protocols. Client, server, or any intermediary can provide information for Keep-Alive header independently. Also, a host can add timeout and max parameters in order to set a timeout or limit maximum request count per connection. This example from ietf.org shows how a Keep-Alive header could be used. All connections are independently negotiated. The client indicates a timeout of 600 seconds (10 minutes), but the proxy is only prepared to retain the connection for at least 120 seconds (2 minutes). On the link between proxy and server, the proxy requests a timeout of 1200 seconds and the server reduces this to 300 seconds. As this example shows, the timeout policies maintained by the proxy are different for each connection. Each connection hop is independent. HTTP pipelining, multiple connections, and many more improvements have been implemented, thanks to the Keep-Alive header’s behavior. With Upgrade header introduced in HTTP/1.1, it is possible to start a connection using a commonly-used protocol, such as HTTP/1.1, then request that the connection switch to an enhanced protocol type like HTTP/2.0 or WebSockets. In an upgraded protocol connection, max parameter (maximum request count) is not present. The upgraded protocol can provide new policies for timeout parameter (if not specifically defined, it uses default timeout value in underlying protocol). This example from ietf.org shows the headers included in an upgrade from HTTP/1.1 to WebSocket[RFC6455]. 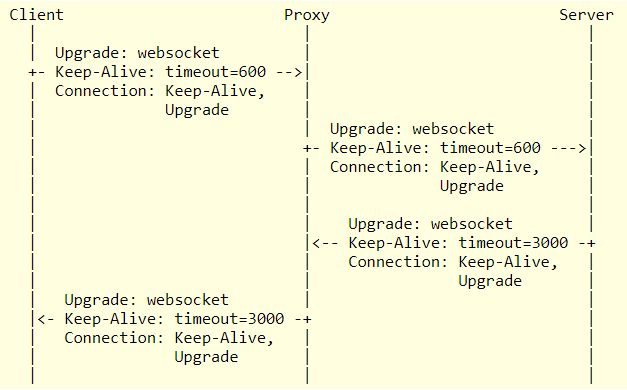 With a websocket upgrade, the connections on each hop cannot have independent lifecycles on either side of an intermediary. After the upgrade, timeout policies cannot be independent for each connection. 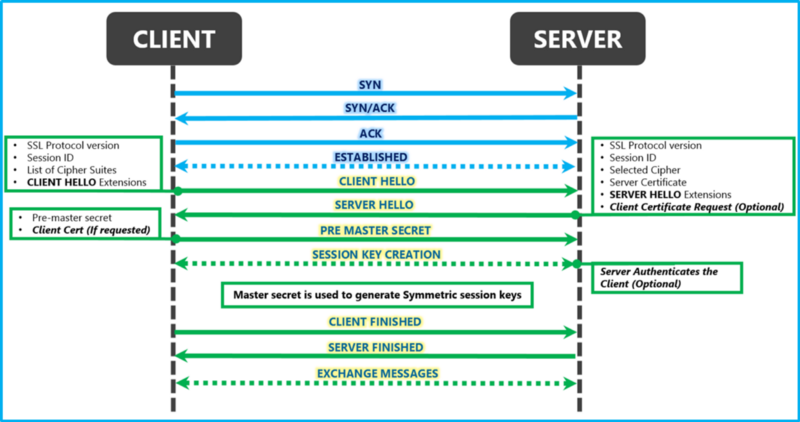 The proxy adjusts the timeout value to reflect the lower of the values set by client and the proxy policies so that the server is aware of the connection characteristics; similarly, the value from the server is provided to the client. Upgrade is said to be a hop-by-hop header. Hyper Text Transfer Protocol Secure (HTTPS) is the secure version of HTTP. It uses SSL/TLS for secure encrypted communications. Originally developed by Netscape in mid-1990s, SSL (Secure Socket Layer) is a cryptographic protocol enhancement to HTTP, which defines how client and server should communicate with each other securely. TLS (Transport Layer Security) is the successor of SSL. An HTTPS connection can protect the data transfer from the man-in-the-middle attacks and common security threats by providing bidirectional encryption for communications between a client and server. Although HTTPS is secure by its design, the SSL/TLS handshake process consumes a significant time before establishing an HTTPS connection. It normally costs 1–2 seconds and drastically slows down the startup performance of a website. All above features are being used by major web servers and browsers today. But modern enhancements like HTTP/2.0, Server Side Events (SSE), and Websockets have changed the way that the traditional HTTP works. In my next article on Web API Design with HTTP and Websockets, we will discuss how we should choose them in real-world projects. Posted in Php. Tagged with http/1.0, http/1.1, http/9.0, https.